Dozens of Palestinian Journalists and pressmen participated in the sit-in before the Office of the High Commissioner in Gaza, in order to commemorate the second anniversary of the martyrdom of 17 of their colleagues in the Israeli aggression on Gaza in summer 2014. The media forum which called for the event urged for supporting the families of martyrs and offering them a decent life in loyalty to their sons. It also called for prosecuting Israeli criminals at international courts for killing Palestinian journalists and targeting their offices throughout the past years. Speakers at the sit-in demanded expelling Israelis from the international forums which are concerned with the freedom of journalism and pressmen. They also called on the international organizations especially the International Federation of Journalists, Reporters without Borders, and the Federation of Arab Journalists to pressure the Israeli Occupation authorities to release the detained journalists. Several Palestinians, including journalists, and international activists, have been injured Friday after Israeli soldiers assaulted the weekly protest in Kufur Qaddoum, east of the northern West Bank city of Qalqilia. Morad Eshteiwy, the coordinator of the Popular Committee in Kufur Qaddoum, said the soldiers invaded the village soon after the beginning of the weekly procession, and fired gas bombs at them, causing several injuries. The head of the Popular Committee against the Wall and Colonies Waleed Assaf called on the international community to intervene and stop the Israeli crimes against the Palestinians people, including the terrorist attack against the Dawabsha family, who were burnt to death in their home after Israeli terrorists firebombed it last year. Assaf stated that the Palestinian people will always practice their right to peacefully resist the illegal Israeli occupation, and support all moves to bring Israel to justice through international courts. It is worth mentioning that the Israeli army used to surveillance drones to film the protesters. Israeli soldiers attacked, Friday, the weekly nonviolent protest against the Annexation Wall and colonies in Ni’lin village, near the central West Bank city of Ramallah, causing one Palestinian to suffer a fracture in his arm, and many others suffered the effects of teargas inhalation. The coordinator of the Popular Committee in Ni’lin Mohammad ‘Amira said the soldiers violently assaulted the nonviolent protesters and fired rubber-coated steel bullets, gas bombs, and concussion grenades. He added that a young man was shot with a gas bomb in his arm, causing a fracture, while many protesters suffered the severe effects of teargas inhalation. Amira added that today’s protest marks that third anniversary of the death of a child, identified as Ahmad Husam Mousa, 10, who was shot dead by the Israeli army, and the first anniversary of the death of Dawabsha family, who were burnt to death after Israeli terrorists firebombed their home, in Douma village, near the northern West Bank city of Nablus. 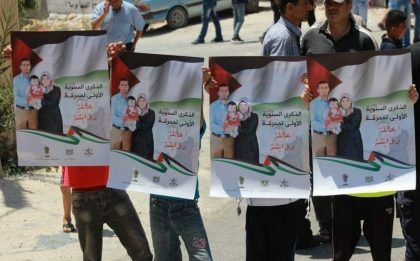 The protesters carried posters of Mousa and the Dawabsha family, in addition to pictures of hunger striking detainee, Bilal Kayed. The soldiers also assaulted Palestinian journalists and tried to force them away, leading to an argument with Palestine TV an anchor, Journalist Ali Dar Ali. The Israeli occupation army demolished 11 Palestinian homes overnight in Qalandiya town, north of Occupied Jerusalem, at the pretext of their location near the segregation wall. The demolitions started last night and continued until dawn Tuesday, amid violent clashes in Qalandiya and Abu Dis towns. According to Qalandiya media center, six bulldozers escorted by a large number of Israeli troops stormed 11 homes at least in Qalandiya and forced their residents out before embarking on knocking them down. Consequently, violent clashes broke out with the occupation troops, leading to the injury of several young protesters from the town. Medical sources said that three young men suffered bullet injuries and at least four others suffocated by tear gas during the events. Journalist Mahmoud Awadallah and chief of the town Yousef Awadallah also suffered injuries when Israeli soldiers physically assaulted them during the events. The Israeli army justified the demolition of the houses by claiming they were built illegally near the wall without construction permits, according to one of the owners. Owners of the demolished houses had received last Sunday notices giving them 72 hours to evacuate their homes before razing them. In a related incident, 30 Palestinian young men suffered bullet and tear gas injuries during confrontations with the occupation troops in Abu Dis town, east of Jerusalem, according to the Red Crescent. Israeli soldiers kidnapped, on Friday evening, five Palestinians, including an elderly man, in several areas of occupied East Jerusalem. The army also shot and injured a Palestinian in Teqoua’ town, east of Bethlehem. 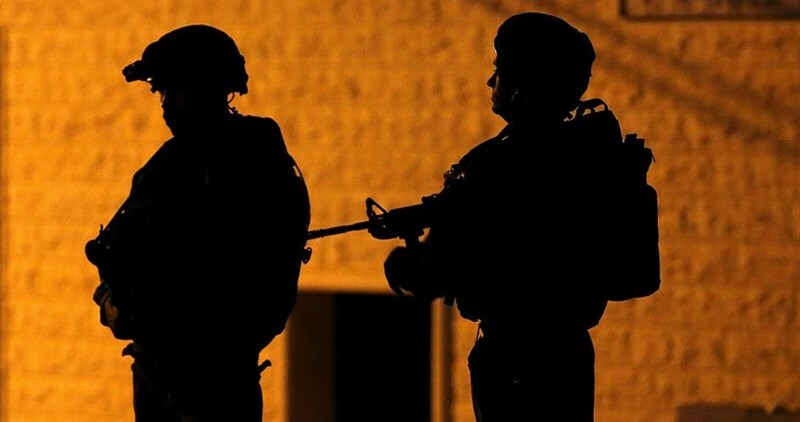 On Friday evening, the soldiers invaded the Sa’diyya neighborhood, in Jerusalem’s Old City, searched homes and kidnapped a young man and an elderly man, before moving them to an interrogation center. The army also kidnapped a young man, identified as Fuad al-Atrash, after stopping him near one of the gates of the Al-Aqsa Mosque. In addition, the soldiers invaded Shu’fat neighborhood, in the center of Jerusalem, and kidnapped a young man, identified as Anas al-Kiswani. The soldiers also kidnapped a journalist, identified as Faisal Refa’ey, from ‘Anata town, northeast of occupied Jerusalem. In related news, the soldiers invaded the town of Teqoua’, east of the West Bank city of Bethlehem, and moderately wounded a young man. Local sources said several youths hurled stones on a number of Israeli military jeeps, invading their town, while the army fired live rounds, rubber-coated steel bullets and gas bombs. One Palestinian was shot with a live round in his abdomen, before he was moved to the Beit Jala governmental hospital. His condition has been described as moderate but stable. Many Palestinians suffered the effects of tear gas inhalation. 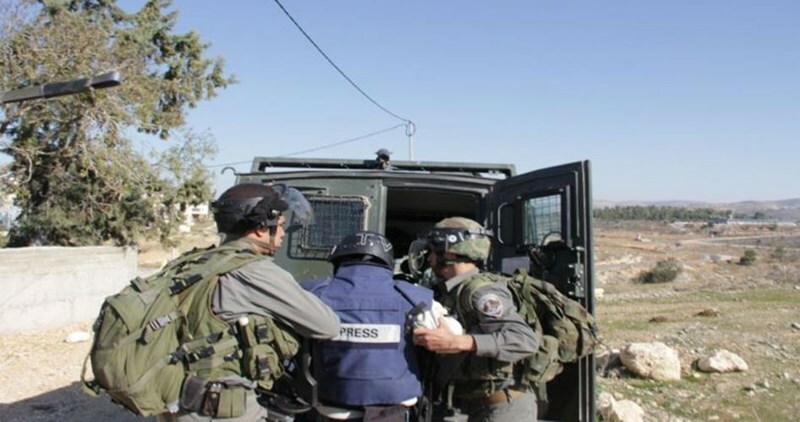 Dozens of soldiers attacked, Friday, the weekly nonviolent protest in Bil’in village, in the central West Bank district of Ramallah, kidnapped four Palestinians, including a Journalist, and briefly detained a local photojournalist. The soldiers used excessive force against the protesters and kidnapped four Palestinians, identified as journalist Khaled Sabarna who works for an Iranian news agency, in addition to the head of the Local Council in Bil’in Khaled Mansour, Journalist Emad Burnat (the director of Five Broker Camera Documentary about Bil’in), and local activist Ashraf Abu Rahma. 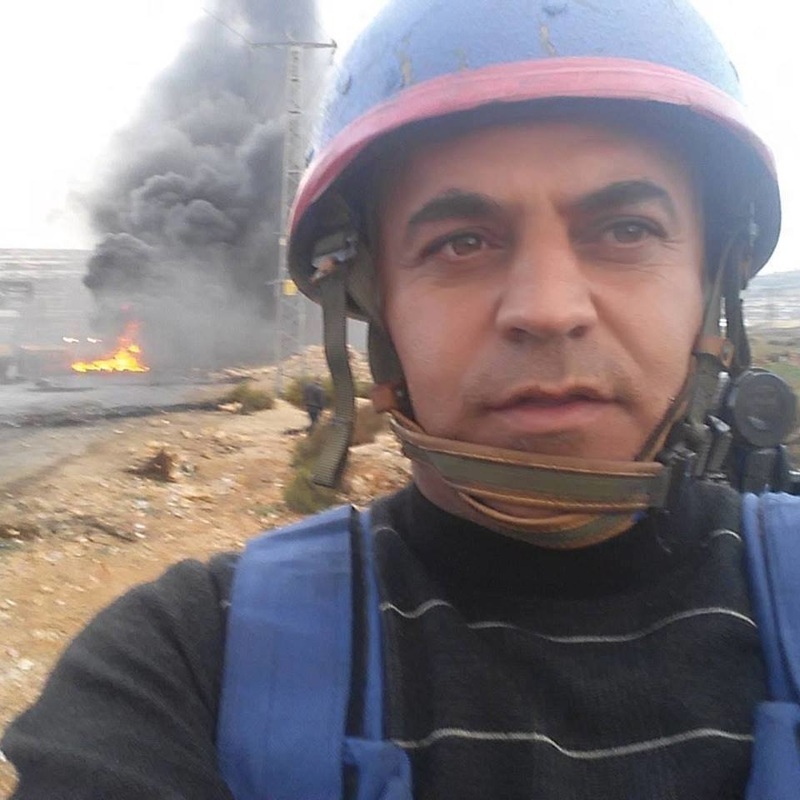 The soldiers also detained photojournalist Haitham Khatib, after confiscating his cameras, and released him later. Many Israeli and international peace activists participated in the weekly protest, and marched from the center of the village while carrying Palestinian flags and chanting for liberation and independence. 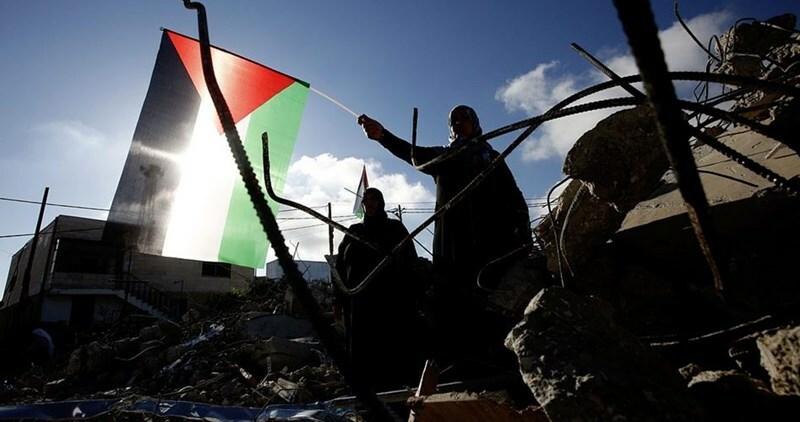 The coordinator of the Popular Committee against the Wall and Colonies in Bil’in, Abdullah Abu Rahma, said the Israeli military assaults and violations will never be able to stop the nonviolent protests. It is worth mentioning that, last Friday, Ashraf Abu Rahma (who was kidnapped today) told the IMEMC that the soldiers were continuously filming him, and that he believes they intend to abduct him later. The syndicate of Palestinian journalists on Monday launched an international campaign to pressure Israeli authorities for the release of 21 Palestinian journalists from its jails. In a statement, the syndicate said that France, Britain, Italy, Spain along with a score of European syndicates as well as others of Latin American states are participating in the campaign. It involves sending letters to both of the EU and the international federation of journalists (IFJ) along with European syndicates demanding the release of those journalists. In a letter addressed to Israeli Prime Minister Benjamin Netanyahu, the IFJ demanded releasing Omar Nazzal, member of the General Secretariat of the Palestinian Journalists Syndicate. A number of syndicates and journalist unions in the world directed letters to Netanyahu and the Minister of the Israeli Army demanding the release of all journalists along with those who are detained over charges related to freedom of speech and political and syndicate activities. 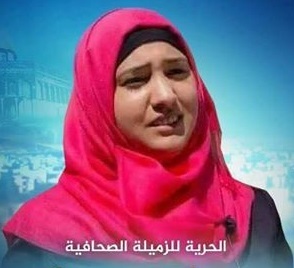 Israeli court sentences journalist to 6 months for "incitement"
Israeli magistrate court in Jerusalem sentenced the Palestinian female journalist Samah Dowaik, from Silwan town east of Occupied Jerusalem, to six months of actual imprisonment after "convicting" her of practicing incitement on Facebook. Israeli forces arrested journalist Dowaik, who works as a correspondent for Quds News Network, from her family’s home on April, 10, 2016. She is now held captive at Hasharon jail. 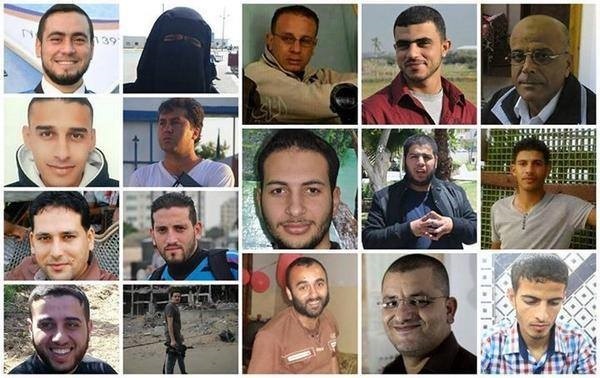 20 Palestinian journalists are detained in Israeli jails. Some of them are serving high sentences while the others are held either under custody or under the illegal administrative detention. Statistics showed that Israeli forces arrested 157 Palestinians between the beginning of October 2015 and the end of April 2016 over charges related to publishing on social networking sites. Israeli court of Ofer on Sunday issued an administrative detention order for three months against the Palestinian journalist Adib al-Atrash. Local sources revealed that journalist Atrash got his Master’s degree from Eastern Mediterranean University in Cyprus months ago and had returned back home to get married as his wedding was expected in September. 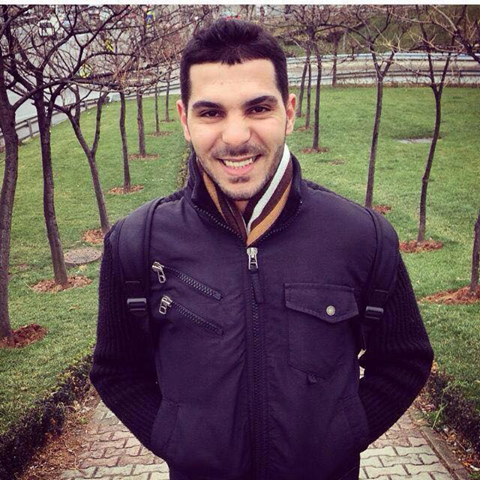 Israeli forces arrested journalist Atrash on Monday, June 20, from his family’s home in al-Khalil city. He was held in al-Maskobiya investigation center in Occupied Jerusalem. 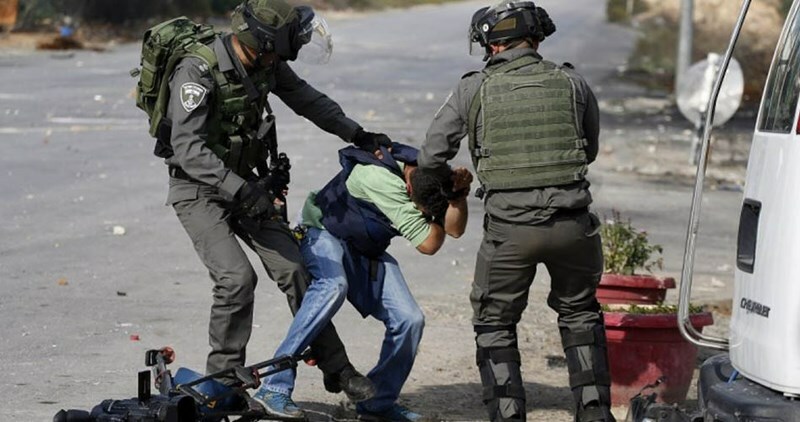 The Israeli occupation forces (IOF) at dawn Sunday kidnapped several Palestinian citizens in different areas of the West Bank and Jerusalem. In al-Khalil, local sources said that an Israeli military force kidnapped two young man and one girl from al-Masalmeh family during raids on homes in Beit Awwa town. The sources added that two other young men identified as Mohamed al-Daghamin and Mohamed Rawashdeh were taken prisoners during a dawn campaign in as-Samua town, south of al-Khalil. The IOF also raided homes in different towns of al-Khalil, including Sa'ir, Ash-Shuyukh, Yatta and Halhoul, and handed citizens summonses for interrogation. In Ramallah, a Palestinian young girl identified as Banan Mafarjeh was kidnapped, for an unknown reason, at a military checkpoint near Beit Liqya town. In Jerusalem, local sources said that Israeli police forces stormed Qalandiya refugee camp and kidnapped a young man called Ahmed al-Lawzi. 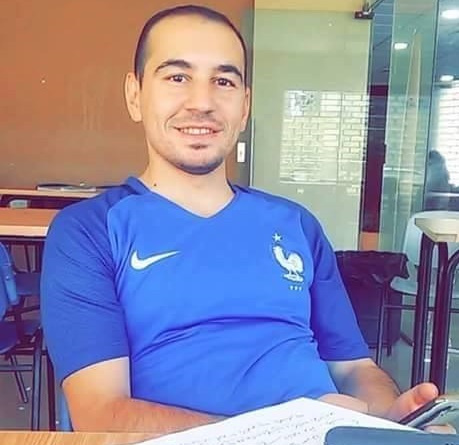 In the nearby town of Anata, journalist Faisal al-Refa'ie received a summons for interrogation from the Shin Bet during an IOF dawn raid. The Israeli occupation forces (IOF) on Thursday kidnapped Palestinian photojournalist Kamel Barham at a makeshift checkpoint near Sarra town, southwest of Nablus. Eyewitnesses said that Israeli soldiers at a roadblock near the town stopped the vehicle which Barham was aboard and checked the IDs of all passengers before rounding him up. Barham, 27, works as a freelancer and covers anti-wall marches and weekly events in Kafr Qaddum town, east of Qalqilya governorate. 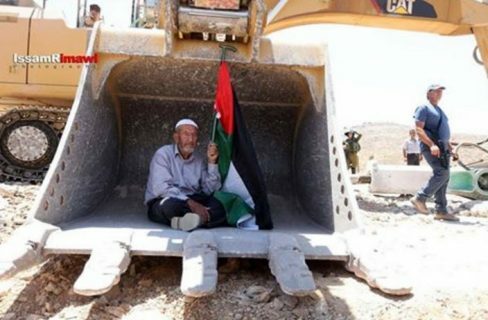 The Palestinians and solidarity activists held protests, Wednesday, in front of the Israeli military bulldozers and managed to remove the soldiers and their equipment out. 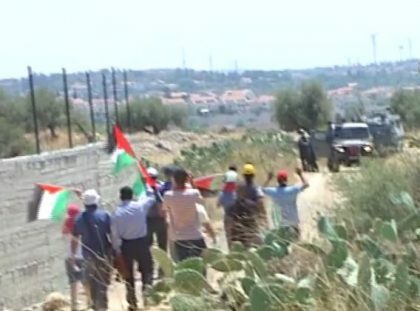 Mohammad ‘Ameera, the coordinator of the Popular Committee against the Wall and Colonies, said the protests were held in coordination with the Ni’lin Village Council, Popular Committees in addition to international and Israeli activists. Ameera added that the soldiers repeatedly tried to remove the protesters, but they remain steadfast, and stopped the bulldozers, forcing the army to leave the area. The army started bulldozing the lands more than four days ago, in order to widen road #446 used by Israeli colonists, living in illegal colonies built on privately-owned Palestinian lands. It is worth mentioning that Israeli police officers ticketed several cars owned by journalists who were reporting on the event, and forced them away.